Please welcome Angel M.B. Chadwick, author of Corridors of my Mind. "I write only what I've experienced myself, no lofty perches here only raw emotion, life experience, and soulful intelligence. To read my books is to know me, mind, body, soul, intellect and spirit my essence is on every page." Chadwick has been writing since she was thirteen years old spanning over twenty years and counting and has developed a unique, unpredictable and God given style that is like no other author out there. A.) When I was 13 years old, and wrote my first short story for a class assignment and got an A+ and bragging rights from my teacher. After that every time I had a writing assignment whether it was writing poetry, a term paper or a literary analysis in college, there was always a teacher or students bragging on my gift for writing. A.) The hardest part is the entire process from writing, editing, publishing, etc. Corridors of my Minds can be found at the following online retailers. A.) I felt relief and vindication because I didn't have to stay in the shadows anymore. A.) All of it is important story, character, plot development, etc other wise what's the point. You need all these things to craft a well rounded and hopefully well written story. A.) Busy, busy, always busy along with raising my rambunctious eight year old son who is autistic/nonverbal and making steady progress everyday and who is my hero. 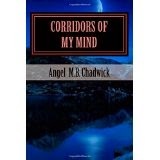 Angel Chadwick is a tour de force writing about the most painful, extremely dark and very, very difficult aspects of her life in her memoir "Corridors of My Mind" written in the unique literary style of lyrical poetry. Her words are visceral and telling of how she speaks from the deepest recesses of her soul. It's a coming of age nonfiction story starting first with her life as a wife, a mother and taking the reader backwards in time from her adulthood to her teenage years, revealing her hardships, relationships and the wisdom she's learned from it all. One of her poems in this book "Life or Some Facsimile of It" is Chadwick speaking to life itself and apologizing to it for ever doing it wrong by attempting or even entertaining thoughts of suicide. She is a fresh, new, yet seasoned and unique multifaceted, multitalented author who has pulled herself out of obscurity many times especially with this book. I don't think so but, thanks for the positive comment. I appreciate it. This was a very lovely interview, keep up the good work. I wish you lots of success.